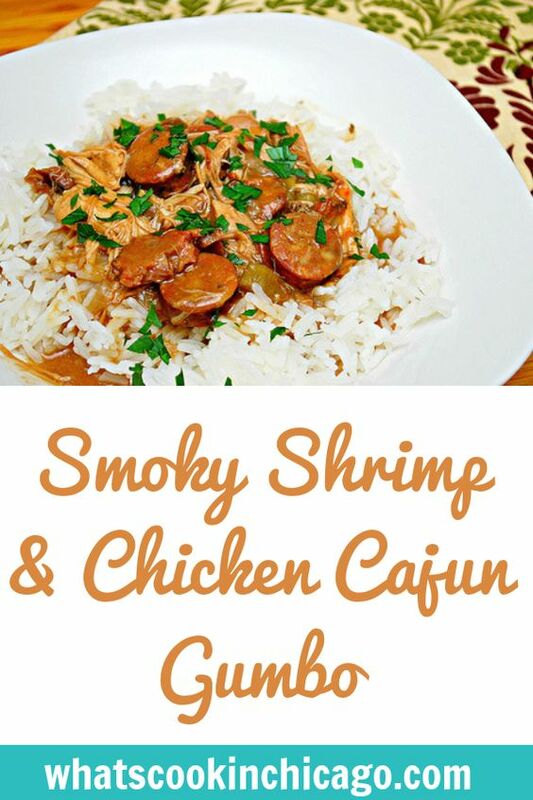 You can't truly enjoy Mardi Gras season in my house without indulging in classic Cajun fare. 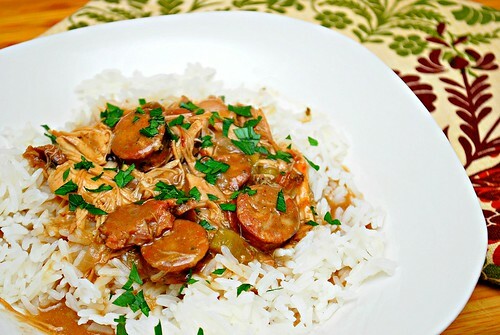 This time, I opted to make this smoky Cajun Gumbo since it's a favorite of mine. We especially love how it's not quite a stew, yet too thick for a soup and its absolutely perfect and comforting over a steaming bowl of rice. If you wanted to cut back on the heat or spice of the dish, reduce or omit the cayenne pepper since that's where the kick comes from. I added Andouille sausage to the original recipe because I love that touch of heat it provides even by omitting the cayenne pepper all together. To prepare the stock, peel and devein shrimp, reserving shells. Cut each shrimp in half lengthwise; cover shrimp, and refrigerate. Place reserved shrimp shells, 8 cups water and remaining stock ingredients into the IP. When the display reflects L0:05 (which is 5 minutes since the IP has beeped), turn the setting on top of your IP to VENTING. Doing so allows the IP to quickly release any remaining pressure (also known as QPR or QR). I use a wooden spoon to carefully turn the setting to avoid close contact with the potential steam. You may also want to turn your IP away from cabinets to allow the released steam to escape freely. The pin at the top of your IP will drop when all pressure has been released and it's safe to open. Open up your IP when the pin has dropped (allow a few minutes for this to happen). The IP will automatically default to WARM mode. Strain mixture through a sieve into a bowl; discard solids. Set aside 3 cups stock; keep warm. Reserve the remaining shrimp stock for another use. Press SAUTE and add 1 tablespoon oil. When hot, add chicken and brown on all sides. Transfer chicken to a large bowl and set aside. In the now empty IP pot, add sausage, onion, Creole seasoning, garlic, celery, tomatoes and bell pepper; sauté for 3 minutes. Transfer sausage and vegetable mixture to the large bowl with chicken and set aside. In the now empty IP pot, add remaining oil. When hot, whisk in flour. Continue whisking until the roux has cooked to the color of a deep roasted, melted peanut butter or chestnut colored, 8 to 10 minutes. Be careful not to burn the roux. Pour in the shrimp stock, add chicken/sausage/vegetable mixture and bay leaves. Stir to combine. Press MANUAL and adjust the time to 25 minutes on HIGH pressure. When the IP beeps after pressure cooking for 25 minutes, allow your IP to naturally release pressure for 5 minutes. While naturally releasing pressure (also known as NPR or NR), the display will reflect numbers counting up from 1. The numbers indicate how many minutes the IP has stopped cooking since it beeped (or how many minutes it has been naturally releasing pressure). No need to touch your IP while it naturally releases pressure. Add shrimp, okra, Worcestershire, Tabasco, black pepper and paprika; stir allowing shrimp and okra to cook through. Discard bay leaves. Serve over rice.